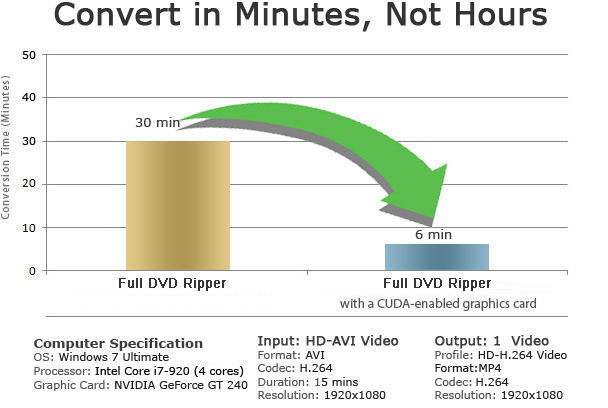 For a better video conversion experience, Full DVD Ripper have been upgraded with NVIDIA CUDA technology offering improved video encoding/decoding performance (when processing high-definition videos in particular) for any computer running on CUDA-enabled GPU. By processing video conversions on NVIDIA's GPU instead of your computer's CPU, more CPU resources can be spared for other applications, making your computer run much smoother. Conversion profiles that leverage CUDA technology are clearly labeled; users can optionally enable GPU encoding/decoding acceleration once CUDA-enable graphics card has been detected. The diagram below shows the improvement in performance when converting with and without CUDA. The results are given in mins. © 2003-2012 | Full DVD Ripper Inc. a Multimedia Utility Company. All Rights Reserved.